Improving and refining diagnostic skills to benefit our patients is a career long commitment for our Steele Creek Animal Hospital staff. Over the summer months, Drs. 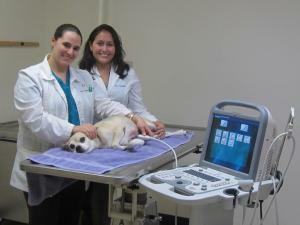 Kerri McDermott and Susan Bonilla attended additional ultrasound imaging courses. Ultrasound imaging is a non-invasive way for your pet's Doctor to "see" inside your pet, aiding in the diagnosis of such conditions as disease or tumors of the abdominal organs, foreign bodies, intestinal obstructions, and bladder stones.